I read recently that AI (artificial intelligence) has advanced so far that some robots can now pass the Turing test, which tests whether a machine’s ability to exhibit intelligent behavior is indistinguishable from a human’s. While robots are still not indistinguishable in all ways, that day is not too far off. Does this mean an AI-powered robot might someday be considered a human according to Jewish law? Could it be counted for a minyan? As the wise King Solomon put it, “There is nothing new under the sun.”1 The concept of man-made men (golems), and the question of their humanness (or lack thereof) has been discussed since Talmudic times. (Of course, there is a huge difference between a “living” golem and a man-made robot powered by AI, but this would seem to be the best place to start our discussion). Was this “man” created by Rava considered human? Was Rabbi Zeira liable for murder? The notion that a golem may have an element of humanness left some, including the Chacham Tzvi’s two sons, a bit puzzled. Both sons, Rabbi Avraham Meshulam Zalman, in his work Divrei Rabeinu Meshulam,9 and Rabbi Yaakov Emden in Sheilot Yaavetz,10 quote Kabbalists,11 who explain that only G‑d has the power to draw a human soul down from heaven. At best, a person using the power of the Sefer Yetzirah can only animate something on par with an animal. It is for this reason that if one “killed” such a creature (as in the story with Rava), they say, it is not considered murder. It should be noted that unlike a robot, a golem has some sort of a spiritual spark animating it. It is brought to life through a righteous individual using the secrets of creation hidden within the Sefer Yetzirah. This is clearly not the case for a man-made robot powered by algorithms. Thus, our robots, powered by computers, are seemingly even less “human” than a golem. Nevertheless, putting that aside for argument’s sake, there is one aspect where a robot may have an advantage over a golem. Everything in the world can be divided into four “kingdoms”: mineral, vegetable, animal, and human. The word for “human” is medaber, which means “speaker.”12 This implies that the ability to speak is integral to who we are as humans. Thus, unlike the Chacham Tzvi, many explain that the reason we can’t count a golem for a minyan is that it lacks the faculty of speech. At first blush, this would imply that if the creature could just talk (as today’s robots certainly can), it would be considered human. Based on this, there are some who have made the surprising claim that if one would somehow make an intelligent and speaking golem (a feat many mystics say is theoretically possible15) it perhaps could be counted for a minyan.16 If this is true for a golem, then perhaps it would be true for a robot powered by AI! The chassidic masters question why humanity is defined as medaber (“speaker”) and not maskil (“understander”).18 After all, as we have pointed out, there are people who are unable to talk and animals that can! Rabbi Sholom Dovber of Lubavitch explains that the use of the term medaber is indeed precise; however, it doesn’t just refer to the ability to talk, but rather to the koach hadibur, the potential or power to talk.19 Human speech is different than any other similar type of communication, for it is not merely an external “revelation”; rather, it reveals what is "hidden" inside the person. Certainly, one can parrot words and sounds, but medaber refers to the power that gives shape, letters and words to one’s thoughts, which are then spoken with one's mouth. 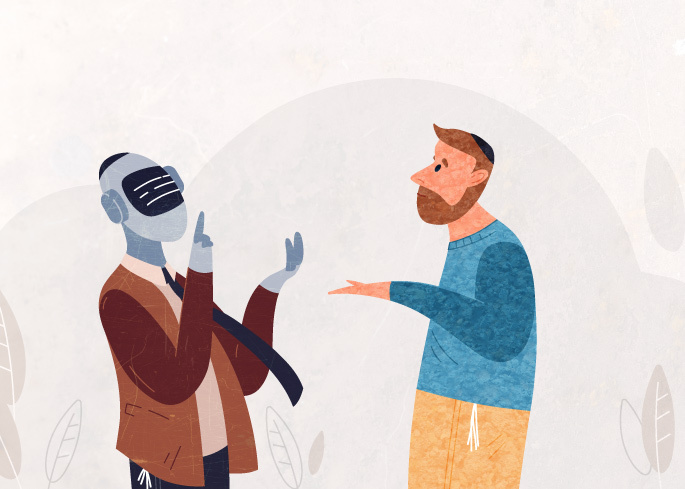 The chassidic masters explain that the faculty of speech is in fact rooted in the essence of one’s soul, and it is therefore much higher and deeper than intellect itself. Thus, although two people may have the same exact thought, they express it in their own unique, individual way. Thus, even when we characterize humans as medaber, “those who talk,” we are essentially also characterizing them as having unique, G‑d-given souls. And that is something that AI cannot replicate. See, for example, Darkei Teshuvah 7:11. Rabbi Moshe Cordovero, Ramak, Pardes Rimonim 24:10; Rabbi Avraham Azulai, Chessed L’Avraham 4:30. See, for example, Igrot Kodesh of Maharash, p. 98. See also Rashi on Genesis 2:7. Igrot Kodesh, Maharash, p. 98. Rabbi Gershon Henoch Leiner of Radzin in Sidrei Taharot, Ohalot 5a. See, for example, Targum Onkelos on Genesis 2:7 and 3:22 (note that he describes man as being given a “speaking spirit,” but at the same time also explain that the uniqueness of man is that only man has the capacity to know good and bad); Rashi on Genesis 2:7 and 3:22; Rambam, Mishneh Torah, Hilchot Teshuvah 5:1;Rambam on Genesis 2:7. Torat Shalom, p. 245; see also Rashi on Numbers 27:16, where it is also implied that daat is a reference to a person’s individuality. Ctrl C, Ctrl V or Ctrl Z? Communication and Learning Not Limited to Humans We've understood for decades that bees communicate with each other by sounds they make, birds communicate with each other by sounds they make, sea mammals communicate with each other by sounds they make... many species of animal have the gifts of speech and understanding. Many have the ability to create homes from objects found in nature. Fewer (very few) have the ability to make tools of objects they find in nature. I'm not sure that any but man can adapt and refine those tools over generations. It may be useful to underscore that a robot does indeed have a soul. Even a rock has a soul (see Rashi on Vayeitzei 28:11). As elaborated in Tanya, nothing came into existence nor remains sustained in existence without the creative force of The Creator, and it is invested with a soul from that very creative process (every moment). The difference is that a robot does not have a Jewish soul. One could argue that because it was forged by a human, it shares a close kinship to a human soul. But, that falls in line with a table and a chair, a fork and a knife. of course not! I was just teasing. But you said yourself that: it did teach you that being Jewish meant "belonging" to a family. so the robot too belong to the family, thus make him Jewish! again as a metaphor. “There is nothing new under the sun” may have been true in the days of King Solomon, but it's clearly no longer true. It is as true today as it was then. Everything "created" today are based on same core principles. And for everything, there can be found a source in Torah, and even history. I strongly recommend reading "Rambam 13 Principles" by Rabbi Chaim Miller, based on the Rebbe's teachings. He has essays that discuss how everything was given in the torah, and yet there appears to be new stuff coming out. There may be different formats and presentation, that SEEM new, but nothing is truly new. What about someone who was conceived from egg and sperm in a petri dish and then spent 9 months in an artificial womb? What if the egg was from a Jewish woman? Human Intelligence How can we assume a collection of programs mimicking human (and some animal) behaviors to be considered AI? If it were real AI then it would probably justify unplugging itself to conserve electricity. It's not AI if it needs to be programmed in order to *not unplug itself. * That's a human-desired algorithm to keep the program running to human-desired specs. The machine will remain dependent on the human(-inputted) specs. Marvin Lee Minsky was a critic of rewarding an AI achievement for conversation-holding robots. The point is that AI is one of the many human-designed tools, and, when we design it to better humans, we're not wasteful of the precious time invested on our inventions. Humans are not just "intelligent animals". - AI robots, as smart as they are, are NOT human. A. G-d may have given humanity the power to create robots, but the talmud (or, Midrash I dont recall the precise source) says that even if all the wise people in the world get together they would not be able to breath life into something as infitsmal as even an insect! This is almost laughable even as a speculation! B. Why do you think we will ever be able to give AI free will? Obviously you need to better understand and study the subject of free will, or you wouldn't make such a statement. Aliens, if they exist as according to the narrations stated by true witness cases and experience of close contact thru the respected by serious scientific research community, then they may be robot-like (in my particular opinion), and thus has not neshama, though having high inteligent (an intelligence quite beyond human civilization today). This because the witnesses accounted reports where these beings having a behavior seemed as strictly objective, stern/serious, and "doctor" like, as if they can't behave like beings with true flow and nuances of sensibility and feeling. I guess they are "robots" not created with synthetic material, but with biological flesh indeed. Then, they are some sort of high intelligent beings that evolved with a completely different path of natural selection. I am not Jewish, but a Scottish "Protestant", -(who has forgotten why we "protest") - When I was 20 years old the hazards of life brought me to share several years with a Jewish family, - I am now 83 years old, and still have many Jewish friends. -- The question "Can Humanoids be Jewish ?" shocks me ! Do Jews now really believe that G_d could create a race of semi-human machines, or hybrid mécano-human creatures?? -- We all have a soul. Today science has given us the gift of understanding many things -- but we still don't really know where or when it (life) began. And terms such as "medaber" and "koach hadibur" are fine, but... - But, as I said, I'm not Jewish and may perhaps do not catch the subtle significance. -- Nonetheless!! Just, - just please, don't destroy your faith and traditions by speculating on "humanoids". Thanks to "Chabad" for allowing such exchanges.